The body has a lot of bits and pieces that the average person knows very little, if anything, about. Take the thin tissue that lines your lungs and the wall of your chest, for example. Did you know that tissue even existed, let alone that that it has a name? It’s called pleura, and just like any tissue on the rest of the body, it can become infected and cause issues. This condition is called pleurisy, and in this article, we will cover everything you need to know about it. We will discuss exactly what pleurisy is, pleurisy symptoms, and even home remedies for pleurisy. How long does pleurisy last, you ask? Read on and let’s shine a light on this mysterious body part and how to treat any inflammation. Pleurisy isn’t very common, but that hasn’t stopped it from making a name for itself historically. It’s the cause of death for a few notable people including one of the founding fathers of the United States, Benjamin Franklin. But, what is pleurisy? Simply put, pleurisy (also known as pleuritis) is when the tissues that line the lungs and the wall of your chest become infected or inflamed. Normally, you would never even know that it’s there. It is gentle tissue that doesn’t cause any friction or noticeable movement. When that tissue becomes infected or inflamed, however, it can cause a great amount of pain and irritation as the pleura rubs between the lungs and chest. Now that you know what it is, it’s time to get into what causes pleurisy. What Are Causes of Pleurisy? In addition to these symptoms, you might also experience fevers, loss of appetite, and chills as there is a buildup of fluid in pleura. The buildup of fluid is called pleural effusion, and it can temporarily take away the chest pain as the fluid basically cushions the pleura, lungs, and chest. Eventually, the fluid will stop the lungs from functioning as they should due to the pressure the fluid is placing on them. This causes shortness of breath and diminishes lung functions. Luckily, there are a few treatments, both medical and natural, that can help put a stop to your pleurisy. In addition to these, if there is a buildup of fluids in your chest, you may be required to stay a night or two in the hospital so that those fluids can be drained properly and fully. This may also be used if there is a severe buildup of pus and mucus in the lungs. If these treatments are properly administered, there should be few to no long lasting effects to your lungs, chest, and respiratory systems. There are also a few natural treatments that can help alleviate the symptoms. There are a few pleurisy treatment at home options that can help with the symptoms of pleurisy. Please note that none of these are meant to replace traditional medical treatments. Instead, these are meant to help augment the medical treatments and hopefully get you back on your feet a bit quicker. • Rest: Rest can help as it can lessen the amount of the stress on your chest and lungs, which can help the inflammation of the pleura. • Basil leaves: Eaten raw or as part of a meal, basil contains nutrients that could help break up mucus, pus, and other fluids that can be build up due to pleurisy. • Warm/hot chest treatment: A warm or hot treatment to your chest can help relieve a number of the symptoms. Place a hot/warm towel or hot water on your chest. The heat may help melt and loosen up the fluids in your chest. • Use a humidifier: Using a humidifier can help relieve your chest pain by helping to loosen and break up the fluids in the lungs, especially mucus and pus. Once broken up, these can be expelled from the body easier. • Olive leaf extract: Olive leaf extract has a number of properties that are great for fighting infections, including those in the chest. Olive leaf extract can be taken in pill form, powder, or taking the leaves and brewing a tea out of them. Combining these with proper medical treatment should help you breathe more easily until your pleurisy is cured. Pleurisy used to be a huge problem. A chest cold could quickly turn into pleurisy and lead to death. 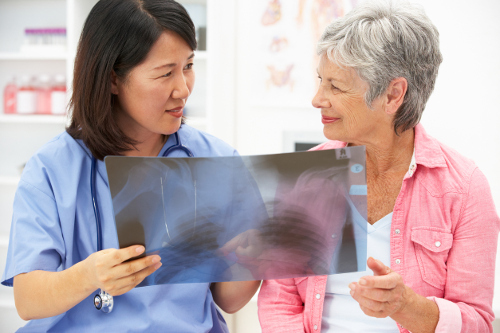 Luckily, with current day medications and home remedies, we now know how to treat pleurisy and clear it up before any major lung damage occurs. That’s if it even occurs in the first place. But that doesn’t mean that you can’t be vigilant. If you get a chest cold that seems particularly painful and tough, look for the symptoms of pleurisy. If it seems to match up, don’t panic. See a doctor. And in the meantime, try out some of the home remedies to help get you through it. Bubbling Feeling in Chest: What Are the Causes? “Pleurisy,” NHS, http://www.nhs.uk/conditions/pleurisy/Pages/Introduction.aspx#Treatment, Last accessed June 6, 2017. “How Long Does Pleurisy Last and How is it Treated?” ePain Assist, https://www.epainassist.com/chest-pain/lungs/pleurisy, last accessed June 6, 2017. “9 Home Remedies for Pleurisy,” Search Home Remedy, http://www.searchhomeremedy.com/9-home-remedies-for-pleurisy/, last accessed June 6, 2017.